What's this, Dhaegon actually being useful outside of being your Shared Hero? Blasphemy! + Visual update! He's Rogar's dad, it's sorta weird they look the same. + Buffed Hp, Atk, and Def! + An Epic weapon, "Ampe-Rage", which deals x3 Damage and grants allies Shocking Touch IV and Shocking Skin IV for 2 turns! + New abilities and passives! Regal Power: When on a team with King Valkin, a random Dwarf ally will receive +1 energy at the start of each turn. Dwarven Crusade: Dwarf allies gain +15% to Crit and Skill. Recycle & Reuse: Whenever an ally uses an ability, 50% chance to gain +1 energy back to that ability. In addition, I feel he should also have Shocking Grasp. Sorta surprised he didn't have this already, actually. Swing and Electric Whirlwind are unchanged. Skull Cracker -> Overcharge: x3 Physical melee attacks on a target with chance to Shock. After attacking, grants all allies +1 energy. Energy cost is 4 turns. Intensify Shock -> High Voltage: Physical melee attack on one target, if the target is Shocked, the attack deals x2.5 damage, gives Dhaegon 2+ energy, and grants him up to [+60% Atk], and [+30% Skill] for 2 turns! Energy cost is 5 turns. Yes! I find Dhaegon to be very weak. These changes would rock! Plus, I love the look you gave Dhaegon. He looks more like an experienced elder warrior, suitable to be Rogar's father. "We should have more tags." By the way, his Epic weapon would buff his Defense, Hp, and Crit Chance. The two materials needed at levels 6 and 12 would be called something along the lines of 'Conductive Core', and 'Dwarven Electromagnet', if that's not too long to fit in. You had me sold at the sick pony-tail. I like these changes - abilities, looks, and the overall energy idea. The epic's name is very clever. 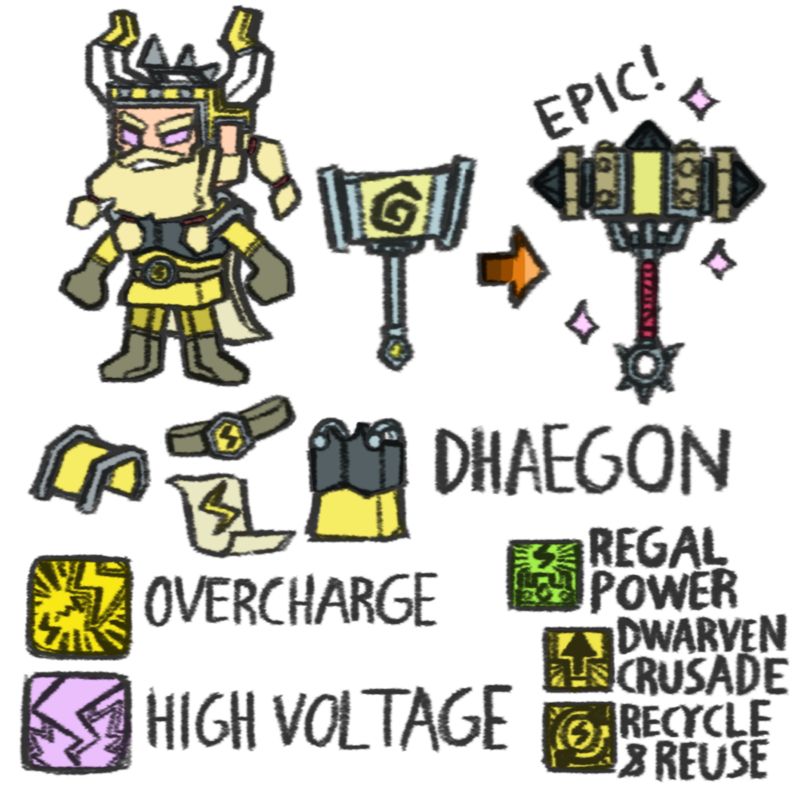 This would make for some nice options with dwarf teams. As someone who uses Dhaegon on ever raid... Please buff him. I even changed it to "Dwarven Crusade" on his picture, cuz I'm dedicated! You're so creative, I love it. Love these ideas too. Is recycle & reuse a dhaegon joke by any chance? We must recycle all the heroes! It's only right for the environment of the Dungeon Boss world! Does anyone have any ideas for the other dwarves? I would love to theoretically 'rework' them along with Dhaegon but I'm not sure what exactly would fix them. Always thought he should at least shock on a crit. I... I honestly thought he had Shocking grasp. Yeah let's add that, too! I think that Rogar needs some more work. Following up on Z8U's idea above maybe Rogar could burn on crits. I also feel like Dhaegon and Rogar should have some synergy, Like Father Like Son where Rogar follows up any attack by Dhaegon and Protect the Youth where Dhaegon would revenge any crit on Rogar. That would make having these 2 together on a team worthwhile. Another option would be to have effects multiply for dwarves. If a dwarf shocks/burns/freezes/dazes any crit by another dwarf would multiply the damage by 1.5 to 2x. I like the idea, but trying to use status effects isn't going to affect things very much. People will still just use Emily and Furnace to counter. Considering you get Dhaegon much later in your DB 'career', and the fact he takes a stupid amount of time to get tokens for, he ought to have some kind of unique ability that doesn't exist on any hero yet. Considering he's Armoured and he seems to thematically be Lighting focused, might be interesting for him to have a Passive that causes all his Basic and Special attacks to apply unavoidable electrocution damage ('unavoidable' similar to MK's Vibrating Palm), which should actually incentivise you to deal with him. Give him a standard AoE ability, and those two abilities combined should be significant enough a threat. Oh, and Lightning Immune of course. I interpret the dwarf team as intended to counter Dodge-heavy teams, so it would make sense for some abilities to deal with that. +1 for shock on crit. Like you, I can't believe Alex and Sifu have this ability but Dhaegon does not. I have one for him too!!! !